Graphite is hierarchically structured, real-time graphing system (Figure 1). 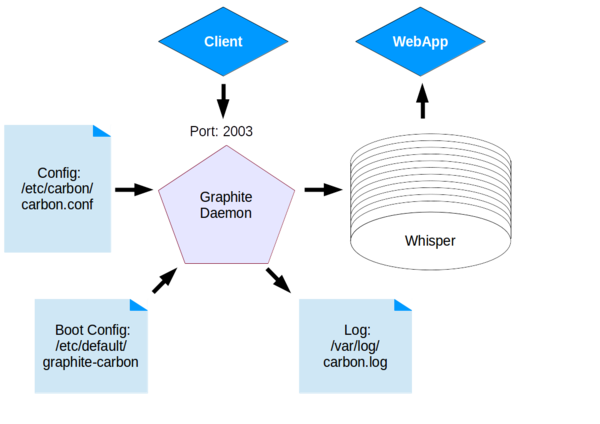 A client collects data from the source, and a Graphite daemon on TCP port 2003 called Carbon receives the data and stores it in a round-robin database named Whisper. A web application then grabs the data from this database and creates charts. The client can be programmed by the user or it can come as a prepared daemon, like collectd. 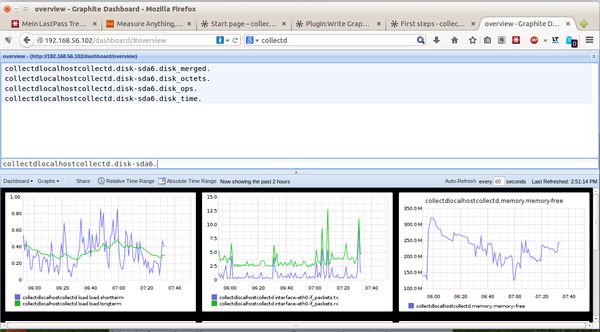 If you like to instrument you own applications, you can send performance data to a client like statsd. Figure 1: Graphite is hierarchically structured; various components must play together. The easiest way to install Graphite is from the package repository of your distribution. Graphite is available in some of the latest distributions like Fedora 20 or Ububtu 14.04 LTS. You can also find ready-made images for a virtualization solution like Docker. A simple docker graphite search shows a number of Graphite images. Of course, you can also install Graphite from the Git sources, but in this case, you have to consider that not all versions of the needed libraries will work well together. The package maintainers have taken over the task of sorting this out for you. All packages come with prepared config files. They contain reasonable defaults, so you won't have much to edit. 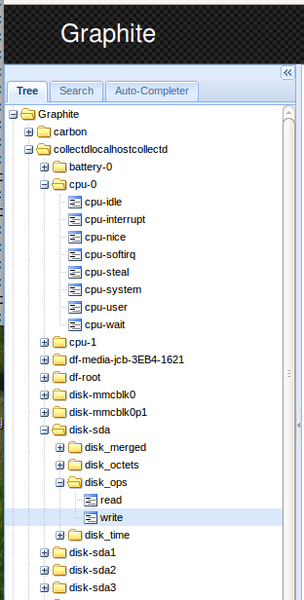 Fedora has the necessary init files, but they are not activated to start automatically on a certain run level. to port 2003 on the Graphite server. The time stamp is an integer value in Unix time (i.e., POSIX time or Epoch time), which is the number of seconds since 00:00:00 Thursday January 1, 1970, Coordinated Universal Time (UTC). The example client in Listing 1 sends the load average values of the last 1, 5, and 15 minutes (lines 22-24), which you can find in the web GUI under the system node. Dots in the name create folders in the hierarchy; to create a graph, you then just click on one of the values in the web app. An alternative to a self-written client is collectd. This daemon, available in most distros from their package management system, can delivery a variety of performance data to Graphite. Figure 2: Graphite tree view detail of the collectd data sources. If you are not interested in operating system metrics, but in the performance of your own applications, statsd is your friend. This daemon can count events, measure their duration, and buffer and forward the resulting values on a regular basis to a back end like Graphite. Libraries for a number of programming languages can increment counters, start timers, and send the results to statsd. In this example, I use the Perl package Net::Statsd to instrument a benchmark (Listing 2). This trivial script first creates a 4KB string of each of the letters a, b, and c; then, it puts the last character of the string into the first position over and over until the string reaches its initial state. The script measures the duration of each pass and sends the value via UDP to statsd. Statsd subsequently forwards the value to Graphite. By starting the script as a cron job once a minute, you can create a chart as in Figure 3. Figure 3: Values passed from the instrumented benchmark to statsd, and then to Graphite. 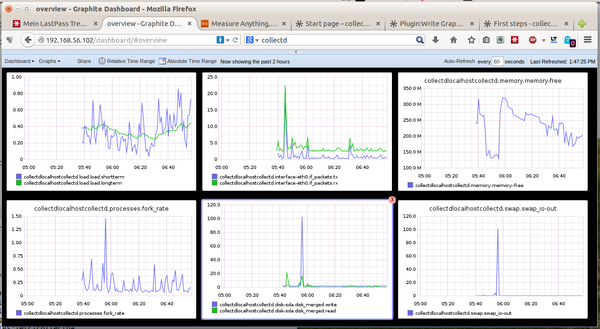 The web GUI contains the tree view of all configured metrics in a left frame and shows a resulting graph in the right frame. If multiple metrics have a similar range of values, you can superimpose graphs. In all other cases, use the Dashboard button, which leads to an area in which you can arrange a number of graphs in the same window by choosing metrics either from the tree view at the left or from a menu in a top frame (Figure 4). Every metric you choose gets its own graph. If you drag one chart on top of another, the graphs are combined (Figure 5). Figure 4: Choose the metrics for the dashboard. Figure 5: Dashboard with superimposed charts. You can save dashboards and reloaded them later, and a search function lets you search for saved dashboards. Chart sizes, periods of time displayed, and automatic refresh intervals can all be customized. Graphite is released under the Apache 2.0 license. It was written by Chris Davis and is maintained and actively developed by Orbitz.com, who claims to “handle approximately 160,000 distinct metrics per minute running on two niagra-2 Sun servers on a very fast SAN” . 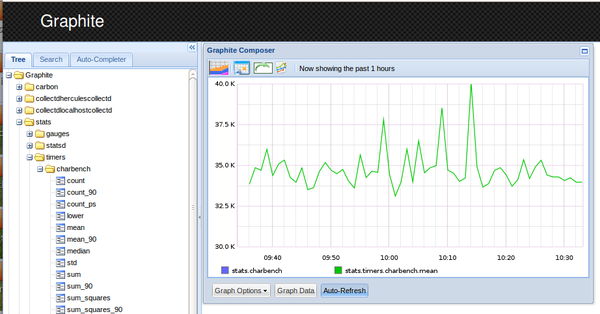 Graphite is thus best used in environments that need to monitor thousands of regularly updated metrics in real time.